Saracens are 11-8 to seal a double double and add the Aviva Premiership title to the European crown they successfully defended against Clermont last week. It would be easy to oppose any other team at such short odds who had just come through a European final and were facing a playoff semi-final trip to in-form Exeter before another showpiece final, all inside three weeks. But Sarries have been rewriting the rule book for the last two years, and they actually seem to thrive on the most demanding of assignments and to take them in their stride. Wasps were Racing Post Sport's ante-post selection to go all the way in the Premiership and they are 9-4 second-favourites as they prepare for a semi-final against Leicester, who finished 18 points behind Dai Young’s table-topping side. A Wasps v Saracens final is the bookmakers’ favourite – Sarries are 1-2 to get to Twickenham next weekend and Wasps no better than 2-7. This repeat of last year’s final, won 28-20 by Saracens, looks by far the more intriguing of this weekend’s games and Exeter look ready to give it a real go. It’s amazing to think that it’s only eight years since the Chiefs made their top-flight bow, and they have proved their appearance in the final last season was no fluke as they finished the regular season on the same number of points as table-topping Wasps. Exeter won 15 matches to Wasps’ 17 so had to settle for second and a tougher semi-final. But they are at home and are the form team in the top flight. After winning just two of their opening six games they absolutely stormed up the home straight with eight consecutive bonus-point victories in their last eight. Confidence is clearly high in the Chiefs camp and they came away from Allianz Park with a draw in January, admittedly against a Sarries side who were a man down for 70 minutes. Exeter can push Sarries all the way, but it could be worth taking a shorter price on eight-point handicap that takes it beyond a one-score game. This season –September 11: Exeter 13 Saracens 34; January 7: Saracens 13 Exeter 13. This won’t go down as one of Leicester’s better seasons even though they have yet again reached the playoffs and lifted the Anglo-Welsh Cup. But since that cup victory and an emotionally-charged win at rivals Northampton they have lost at Bath and beaten three bottom-half teams, with their third coach of the season at the helm. 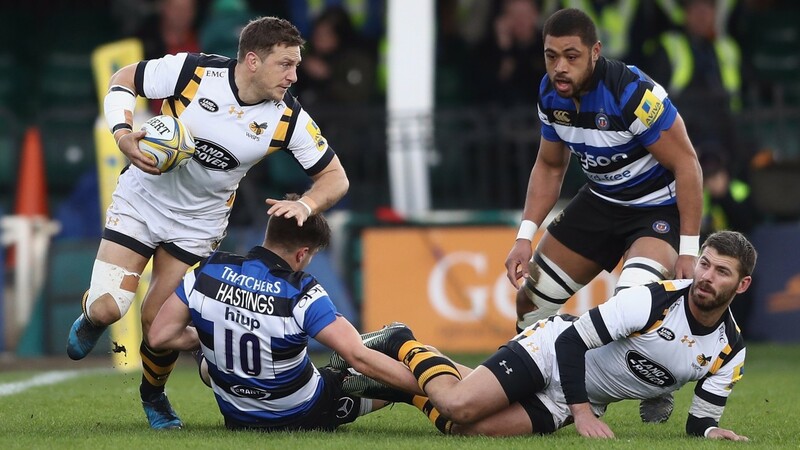 Wasps’ record reads well – they were the only side to win all their Premiership home games and have 17-try top scorer Christian Wade in their side. They also have top pointscorer and player of the season Jimmy Gopperth, who has been at the heart of their attack and is the only back to have scored and set up at least seven tries this season. At 4-1 he is worth a wager to cross the tryline. This season –September 10: Leicester 22, Wasps 34; January 8: Wasps 22 Leicester 16. Gloucester’s loss in last weekend’s European Challenge Cup final is Northampton’s gain as they line up against Connacht in a qualifying semi-final for next season’s Champions Cup. The Saints are eight-point favourites and the winners will face the winner of Friday's Stade Francais v Cardiff clash.